Many SAP customers have already started to use SAP Cloud Platform Rapid Application Development (RAD) by Mendix and realized that creating business applications is not only faster and simpler than with traditional development tools, but it’s also much easier to create fully secure and scalable enterprise applications. Developers use SAP RAD by Mendix to create autonomous full-stack cloud applications, consisting of a data model, business logic, and UI parts. Then, with the click of a button, they deploy and run the completed application on SAP Cloud Platform. Developers also easily create “hybrid” cloud applications that connect to on-premise SAP systems, consume OData services, and extend them with business logic. Do you think we can expedite the development process even more? Yes, we can! Using SAP RAD by Mendix, the development process follows a model-based development approach. The first development step is to create the domain model of your application. Typically, this involved building a complex domain model based on the OData service you want to extend. 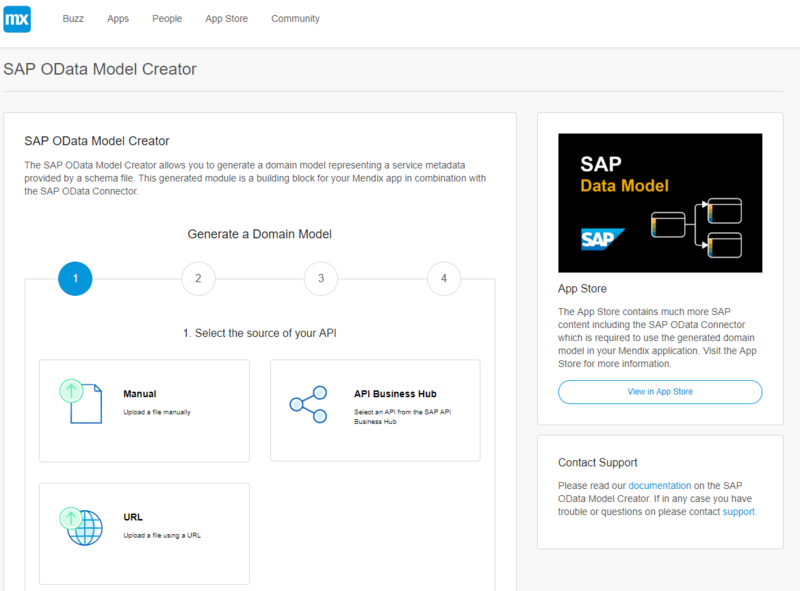 You can now use the SAP OData Model Creator which is available in the Mendix App Store. With this great connector, you can now simply generate the domain model for SAP and customer-specific OData services by importing the service metadata into the connector and include its output in your application. Data retrieved from the SAP OData service can then be mapped effortlessly, allowing you to concentrate on the part you want to extend, whether it be the data model or the business logic of your app. But how to find the right service? The SAP OData Model Creator is now also integrated with the SAP API Business Hub. You can explore the SAP API Business Hub and search for the right service directly from the connector. Then, with the help of a short wizard, you can even generate the corresponding domain model and integrate it into your application. 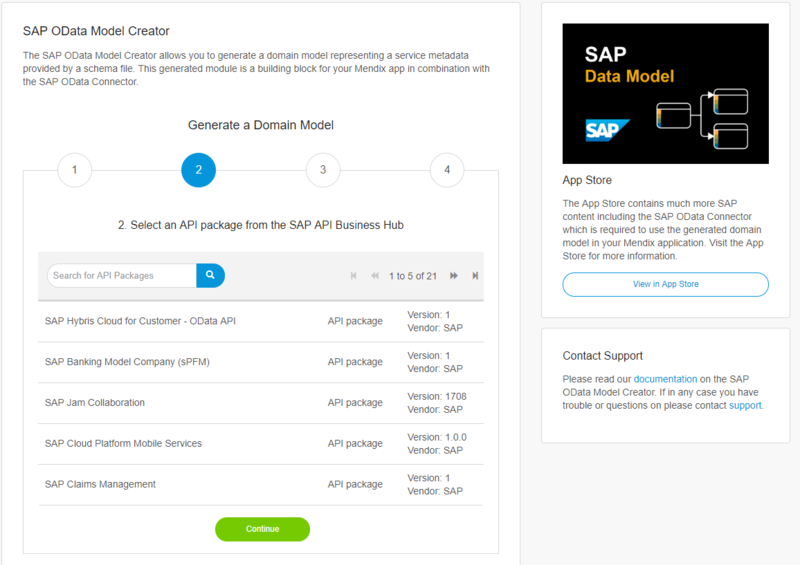 Once you have created the domain model based on your OData service, adding the SAP OData Connector to your application enables you to use all the advanced OData service capabilities in the application business logic, from data retrieval to calling OData functions. These capabilities are added as actions to the Microflow Activities. Secure connectivity between your application on SAP Cloud Platform and your on-premise data is a key factor in your journey to the cloud. The integration between the SAP OData connector and the SAP Connectivity service ensures your data is protected. 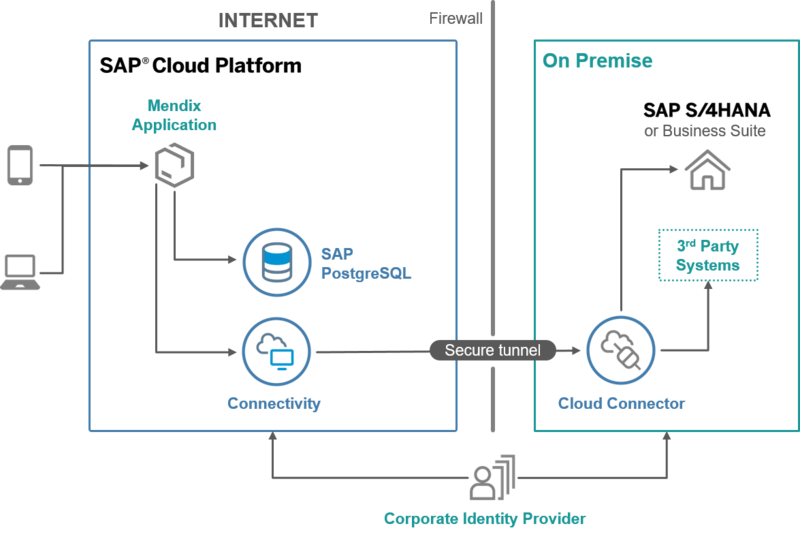 With the latest capabilities of the SAP connectivity service, you can provide a seamless single sign-on (SSO) experience for your user and enable principal propagation from the Mendix application running on SAP Cloud Platform and your SAP backend system. Leverage the SAP secure connectivity also to consume REST and SOAP services from your SAP and 3rd party on premise systems. The call to the service will be tunneled through the SAP secure Cloud Connector and the data will be made available for you in your application. This key capability enables you to combine OData services and other types of services to create added value to your business without jeopardizing your application security. With this, quickly leverage SAP Cloud Platform as your integration and orchestration platform combining multiple data sources into one application. Simplifying and accelerating the development of SAP Cloud applications. Increasing the level of Mendix-SAP integration and expanding it to new areas. Supporting the strategic SAP Multi-Cloud vision.